Warm up with this Mexican-spiced vegan lentil soup this Winter season. I have always loved lentil soup! When I was younger, my mom used to make a very simple lentil soup that consisted of garlic, lentils, tomatoes, and cilantro. That was it! Well, she added vegetable broth too but I was so impressed at just how tasty her soup was with only five ingredients. I don’t recall ever getting tired of having it at home and to this day, I can have lentil soup any time of day, any season, and flavored in any delicious way. Mom used to tell my sister and I a story about lentils having great health benefits. She told us that these little green lentils worked together with ‘red soldiers’ and ‘white soldiers’ in our bodies to helps us stay healthy. Mom was no nutritionist and it wasn’t until I started learning about nutrition that I realized what she meant behind her cute, short story. Turns out, the ‘soldiers’ were in reference to red and white blood cells. More specifically, red blood cells contain hemoglobin which is a protein that helps carry oxygen in our bodies via iron present in lentils. How clever of her! Lentils are a type of legume that contain complex carbohydrates and are a great source of plant-protein. Half a cup of lentils provides about 8 grams of fiber and 9 grams of protein. Lentils are also a good source of iron, which is an important mineral for vegans. Learn how to increase your iron intake and why it’s important in this article. I love mom’s simple lentil soup but over the years I have re-created my own by adding more veggies and spices. 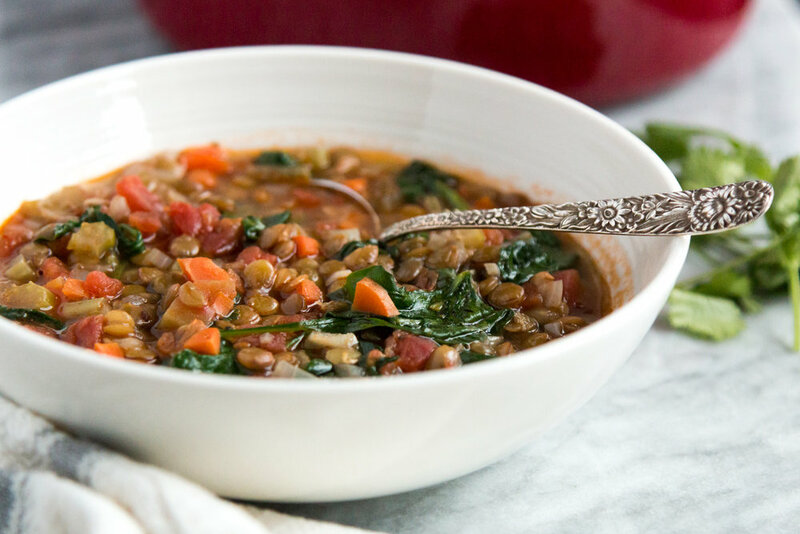 This lentil soup offers more nutritional benefits as it contains various vegetables and a hearty bowl full of flavor by using spices used in my culture. Hope you enjoy it just as much as I do! In a medium dutch oven or pot, heat oil and sauté onion, garlic, and red chili flakes for about 2-3 minutes. Add carrots and celery and cook for another 5 minutes. Then stir in oregano, cumin, salt & pepper to taste. Add lentils, tomatoes, and water/low-sodium vegetable broth and cook until lentils are tender, about 25 – 30 minutes (at this time you may adjust taste with seasonings). Turn off heat and stir in spinach and cilantro. Cover and let sit for about 2 minutes to allow spinach to fully wilt in soup. Serve and enjoy with some bread or tortilla chips. * This recipe works well with finely chopped serrano chiles or jalapeno as an alternative as well.